This WonderPana FreeArc Core Unit Kit from FotodioX includes a WonderPana FreeArc Core Unit designed to specifically fit the Sigma 20mm f/1.4 DG HSM Art lens, as well as a WonderPana 6.6" Holder Bracket. Those items can be combined to allow for the convenient use of two 2.5 to 4.0mm-thick filters measuring 6.6" wide, or one 2.5 to 4.0mm-thick filter measuring 6.6" wide along with one FotodioX 145mm round filter behind it. A compatible 145mm circular polarizer filter and a 145mm inner-pinch lens cap for 145mm FotodioX round filters are also provided. 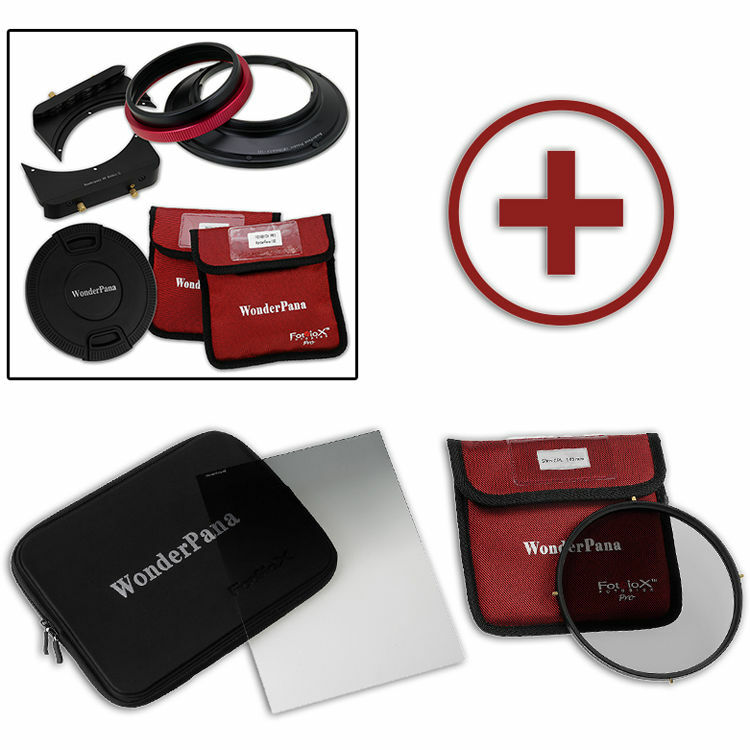 The included WonderPana FreeArc Core Unit consists of two components, a front filter holder and a rear lens collar. Placement of this FreeArc Core Unit onto a Sigma 20mm f/1.4 DG HSM Art lens is easily accomplished by sliding the rear lens collar over the rear of the lens until it has achieved a secure fit. Afterwards, the front filter holder can be screwed onto the front of the installed rear lens collar. To use the WonderPana 6.6" Holder Bracket with the FreeArc Core Unit for a Sigma 20mm f/1.4 DG HSM Art lens, pre-tapped threaded inserts along the edge of the front filter holder accommodate the six included brass short-screws for correct positioning of the WonderPana 6.6" Holder Bracket's two assembly pieces so that they are placed parallel to each other and can hold a 6.6"-wide filter between them. Once the holder bracket and the front filter holder are combined, and the separate collar has been slid over the rear of a Sigma 20mm f/1.4 DG HSM Art lens, the front filter holder with the attached holder bracket can be screwed onto the installed rear lens collar. After being fitted onto a Sigma 20mm f/1.4 DG HSM Art lens, the bearing design of this WonderPana FreeArc Core Unit allows a WonderPana 6.6" Holder Bracket to be rotated 360°. This permits the use of graduated neutral density and other filters that are enhanced by varied positioning. The FotodioX 6.6 x 8.5" Hard-Edge Graduated Neutral Density 0.6 Filter is a filter designed for use with the WonderPana 66 and FreeArc filter holder systems. It helps to darken specific areas of an image, such as bright skies, while allowing for a normal, unaffected exposure in the other regions of the image. The filter is densest at the edge and tapers to clear by the middle, with a hard-edged line of transition between the dense and clear areas. Neutral density filters do not affect the coloration of the image and this filter provides up to a 2-stop reduction in light from entering a lens. Box Dimensions (LxWxH) 10.2 x 8.4 x 1.9"